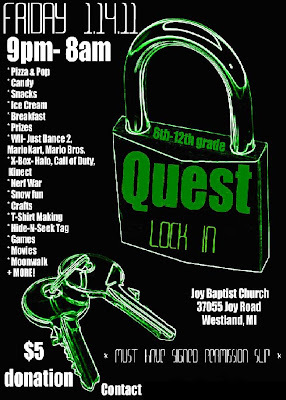 My husband and I are the teen leaders for a small Baptist church in Westland, Michigan. Our usually has about 100-150 on Sunday mornings. Westland is about 20 minutes west of Detroit. It is a middle class area with a lot of blue collar families. Currently in our HS (high school) group we have about 5 "kids" that come regularly. In our MS (middle school) group we have about 10 "kids" that come regularly. We usually only work with the HS-er's but sometimes do "combo" nights. A lot of our big events are both groups together. Recently we had a [LOCK-IN] or an "all nighter." We were planning on about 20-25 kids since we usually have about 20 on Sunday nights + a few friends. We ended up with 40 kids! and 5 adults. AWESOME! The event started at 9pm and went until 8am the next day. We had a lot of fun. 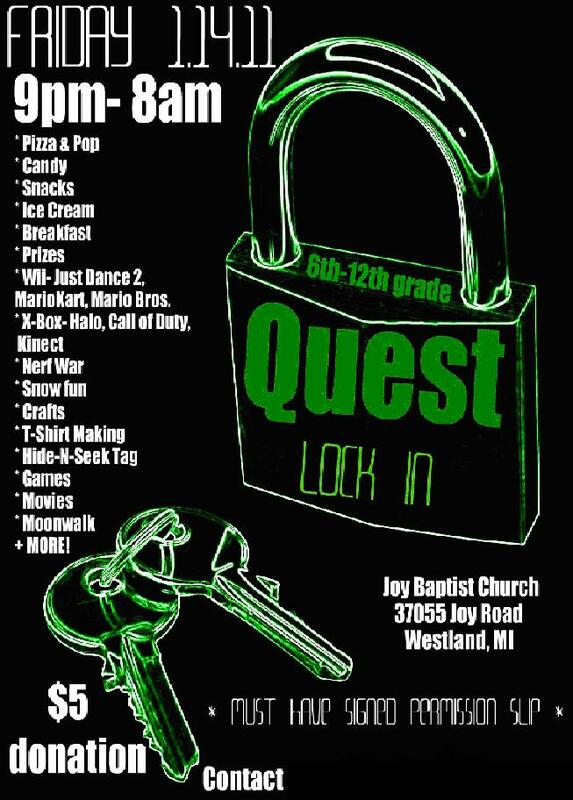 Below is the flyer we made using [PICNIK]. I like to think I'm a pro... but I'm not really... Teens also had to have a signed permission slip to attend the event. more are listed on the flyer, i'm just highlighting a few. We made [T-SHIRTS], which I thought were a lot of fun. We bought t-shirts from Joann Craft Store and Michael's using store sale promos, cheap black spray paint. The kids LOVED it. It was rented for $200 for 8 hours and well worth the money. The only issue was the tiny child size opening, but we made it work! A lot of the night was spent in the gym (with the bouncer set up) playing [BASKETBALL]. I was super panicked about not having enough food- but I actually had to take some BACK! YES- KROGER DOES RETURNS!!! AWESOME. Bought candy and chips and stuffs from Kroger, all Kroger brand, kids didn't even know! Served [ICE CREAM] after the Bible lesson... was a little disorganized... but we made it work. Ordered 10 pizza's from [HUNGRY HOWIES] the guy thought we were pranking him. We had a 25% off coupon from our $5 "damaged" Entertainment Coupon Book. We had more than enough food, because as the night went on people were eating less and less. More, More, More- it would be better to be over prepared... at some points the night dragged a little bit.